Apple has given a straight to series order for eight episodes of "Lisey's Story," a TV show based on the Stephen King novel of the same name, reports The Hollywood Reporter. 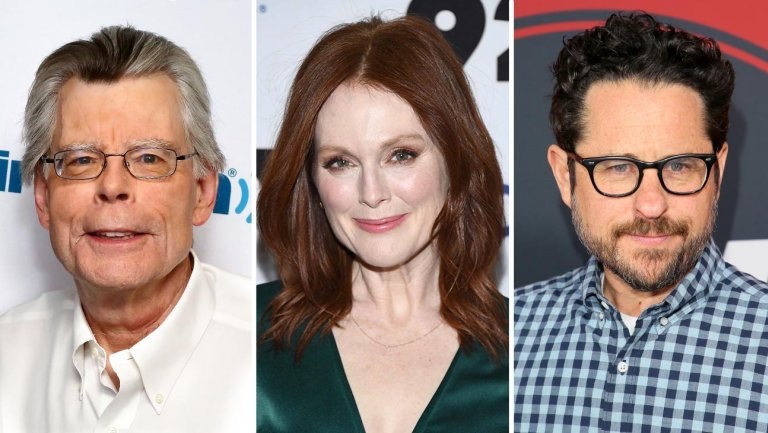 Julianne Moore is set to star in the series, while Stephen King will write all eight episodes in addition to executive producing. As The Hollywood Reporter points out, King does not often write for TV shows, making "Lisey's Story" notable. In the past, King has called "Lisey's Story" one of his favorite books, and one that he'd love to see turned into a television series. The novel, which is a psychological horror with romance elements, is split between Lisey's life in the present time and her dead husband's life (a famous novelist) as she remembers it. Lisey begans to remember things about her husband that she had suppressed while being terrorized in the present by a former fan of her husband's. Along with King and Moore, the series also boasts J.J. Abrams and Ben Stephenson of Bad Robot Productions as executive producers. This is the third series Abrams is working on for Apple, as he is also developing "Little Voice" with Sara Bareilles and "My Glory Was I Had Such Friends" with Jennifer Garner. Julianne Moore has recently starred in movies that include "Kingsman: The Golden Circle," "Bel Canto," "Gloria Bell," and "Suburbicon," but she has not been in a television series since her stint on "As the World Turns" in the 80s, with the exception of a few appearances on "30 Rock." Apple currently has more than two dozen television shows in the works for its upcoming Apple TV+ service, which is set to debut this fall. We have a running list of all of the TV shows and movies that Apple is working on available in our original content guide. Interesting. I'm starting to think there might actually be some good content. Stephen King, done properly, can be extremely good, especially if it is based on one of King's better works. And, Abrams is both a great imitator and an obvious fan of King (Super 8 is, essentially, a perfect Stephen Kingesque story. As if someone had taken one of King's best works and transformed it perfectly onto film; the young love, the friendships of youth, the heartache and heartbreak, the terrible things that happen to good people, the "supernatural" elements. It's all there. When I first saw the film I was shocked that King wasn't involved. It's just that good an imitation). For those who don't read King because he is undoubtably inconsistent (the second half of IT kind of stunk, because the novel IT also kind of goes on and on like that and loses much of the book's early magic as it progresses), but he is also frequently brilliant, both from the entertainment perspective and the literary perspective. He's got a kind of brutal honesty when it comes to human nature, and he is, when he is at his best, absolutely brilliant. He isn't really a "horror" writer as-such. His books and stories almost all inhabit a multiverse in a way that is portrayed, often, in a supernatural way, but is really more Sci-Fi. If I were to suggest a single starting place for people wanting to jump into King I would say "Joyland". It is one of his shorter works and is absolutely, heartbreakingly brilliant. If you don't weep at points when reading it you have no soul. Stephen King: This is going to be great. Tim Apple sends a note: Don't be mean. Stephen: WTF, didn't you read the treatment? Tim: We just want you to make a few changes so it'll be family friendly. JJ Abrams: Just write yourself into a corner and give the fans a **** ending, that's what I always do. Stephen: I've died and gone to hell, haven't I? Right now I don't care who writes/produces/stars in any show or movie- Apple or anyone else's. Past triumphs do not guarantee future success. Lots of very talented people have been involved in absolute rubbish because whoever backed them wanted to use those talented peoples name without bothering to let them work. And sometimes even a certified genius bombs. Don't care about names. Show me. Can't stand Jullianne Moore. Haven't liked her from Boogie Nights until today. You know, TV is just that...TV. I don't doubt some of the ATV+ content will be great. The question is if that will be enough to entice people to subscribe to it. I think Apple will charge a lot for the service. Ideally, Apple should have a bundle subscription that encompasses all services + iCloud storage at a reasonable price for individuals and families. If not, I don't see myself jumping on the bandwagon. Apple has given a straight to series order for eight episodes of "Lisey's Story," a TV show based on the Stephen King novel of the same name, reports The Hollywood Reporter ('https://www.hollywoodreporter.com/live-feed/julianne-moore-star-stephen-king-jj-abrams-apple-drama-liseys-story-1200281'). In the past, King has called ('https://variety.com/2017/tv/news/stephen-king-mr-mercedes-it-movie-what-scares-him-1202518482/') "Lisey's Story" one of his favorite books, and one that he'd love to see turned into a television series. Apple currently has more than two dozen television shows in the works for its upcoming Apple TV+ service ('https://www.macrumors.com/guide/apple-tv-plus/'), which is set to debut this fall. We have a running list of all of the TV shows and movies that Apple is working on available in our original content guide ('https://www.macrumors.com/guide/apple-tv-shows/'). Had me at Stephen King, lost me at Julianne Moore. bleghhh. washed up, over paid springs to mind when i hear about the creatives involved with apple tv. I really dont care, there is so much content out there, its over whelming. I sub to netflix and amazon prime and find i barely watch prime, so multiple subs for me wont happen. That said, Julianne Moore is a modern goddess and I will never tire of seeing her face on anything.